After three decades together, the Penderecki String Quartet has released its first full album of new Canadian composing. 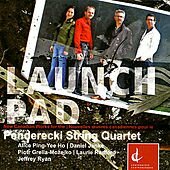 “Launch Pad” features the works of five composers, written between 1999 and 2006. Laurie Radford’s Everything We See in the Sky was written for string quartet and digital signal processing. This piece explores energy, volume, and emotion through a wide variety of technical and tonal techniques. The first sounds on the piece are jumpy, dissonant chords played over atonal runs, which creates an aharmonic glissando effect in all the instruments of the quartet. Pitor Grella-Mozejko’s The Secret Garden (Music for Agnieszka Hollan), and Daniel Janke’s String Quartet No. 1 provide colour, but are not as powerful as the closing track, Jeffrey Ryan’s String Quartet No. 3 sonata distorta. This piece was written for Tolstoy’s novella The Kreutzer Sonata, a tale of jealousy and murder surrounding two musicians and lovers performing Beethoven’s works. Ryan uses melodic motifs to create feelings of love, jealousy, and madness, playing with themes from Beethoven to tie the music to the story. Overall, “Launch Pad” is a well-constructed album marked with unique and musically intriguing moments.